Glucose (C6H12O6; FW: 180.16) is a very important fuel source to generate universal energy molecules ATP. Glucose level is a key diagnostic parameter for many metabolic disorders. Measurement of glucose can be very important in both research and drug discovery processes. The Glucose Assay Kit provides direct measurement of glucose in various biological samples (e.g., serum, plasma, body fluid, food, growth medium, etc.). Glucose Enzyme Mix specifically oxidizes glucose to generate a product which reacts with a dye to generate color (? = 570 nm) and fluorescence (Ex/Em = 535/587 nm). The generated color and fluorescence is proportionally to the glucose amount. The method is rapid, simple, sensitive, and suitable for high throughput. The assay is also suitable for monitoring glucose level during fermentation and glucose feeding in protein expression processes. The kit detects 1-10000 µM glucose samples. This assay provides for the detection of Glucose in various biological samples. 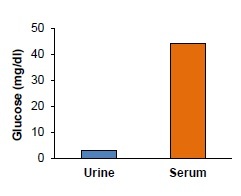 Quantitation of Glucose in human urine & serum. Urine & serum samples were deproteinized using a 10 kDa Spin Column (10000xg, 10 min, 4°C). Urine filtrate (20 µl) & serum filtrate (1 µl) were spiked with a known amount of glucose as internal standard (4 nmol). Urine: 3.00 ± 0.4 mg/dl; Serum: 44.2 ± 6.7 mg/dl.